This dwarf spreading Canadian Hemlock has main branches that curve and bend downward to create a graceful prostrate habit. The bark on the smaller interior branches produce a silvery hue. Very attractive against the small dark green needles. Tsuga 'Coles Prostrate' is a great choice for cascading Bonsai. Keep outdoors. 7 years old, 11"-12" tall. 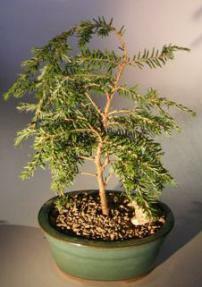 Recommended outdoor bonsai tree, grown and trained by Bonsai Boy.